If u thought Gudlevskis was good, you haven't seen Elvis Merzlikins, 19, playing for Swiss HC Lugano. Pencil him in for Pyeongchang2018. The Latvian Elvis – “Suspicious Minds” may beg to differ but I believe that the next (or is it the first?) 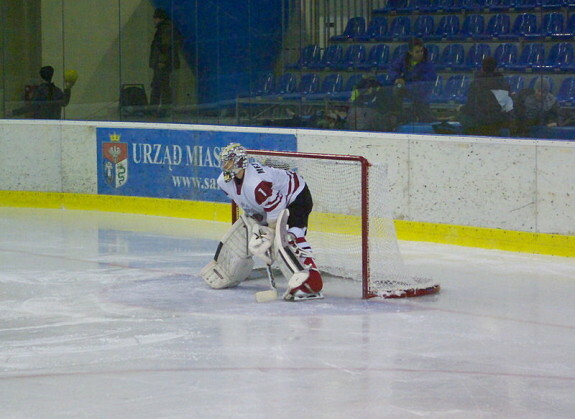 great Latvian goalie will not be the Latvian star from the 2014 Olympics, Kristers Gudlevskis, but it will be Elvis Merzlikins, the Latvian teenager who took the NLA (top Swiss professional league) by storm this year (22GP – 2.13 – .924). Qualities – Elvis, an overager at 20, displays a confident mature game. He already plays a North American style game, coming out and challenging the shooters, deadening the puck to prevent rebounds. However, he also will flash his athleticism and agility to prevent the puck from entering the net. Sometimes there is a “Whole Lotta Shakin’ Goin On.” What stands out for me, however, is his play with the puck; he already handles the puck better than a lot of NHL defensemen. Like the original Elvis (Elvis Presley), Elvis can be a real showman at times and he is a real individual. He can always say, “I Did It My Way”. Dream – While Elvis loves the team and the city of Lugano, Elvis would say, “If I Can Dream, I would love to go to “America” and the NHL.” To “Follow That Dream” and improve his chances of making his dream come true, Elvis decided to use English as his training language this year. Draft Placement – This is the first post Kristers Gudlevskis (after his electrifying Olympic performance) draft. Consequently, Latvian goalies (previously forgotten or just remembered as an afterthought) have gone to where NHL teams can now say they are “Always On My Mind”. The prospects no longer have to yell out, “Do You Know Who I Am?” Normally, an overager from Latvia would either not get drafted or go in the late rounds. This year is likely to be different. “I Just Can’t Help Believing” that Elvis will be taken in the third. However, given his talent and results and the “Burning Love” for Latvian goalies this year, who knows how high Elvis could go?